I am currently doing some graphic design work around famous films. My end goal would be to sell A4 / A3 prints via an online through a platform such as Etsy (or in time my own website). I am based in the UK, and would be looking to sell within the UK but also abroad (as Etsy is big in the US etc). I have tried to read up on this subject myself but it seems very intricate and I would of course want to be 100% confident on this area. When I look on websites such as Etsy I see many "similar" artworks to those which I am proposing to create, but am conscious that this is quite a nuanced area and that those sellers may hold rights I don't (or be acting improperly which I will not do)! 1) My main area of interest is mostly around "cartoon" images of film characters. Specifically, taking screenshots of actors / actresses from within a movie scene, then creating a stylised artwork of said actor / actress. 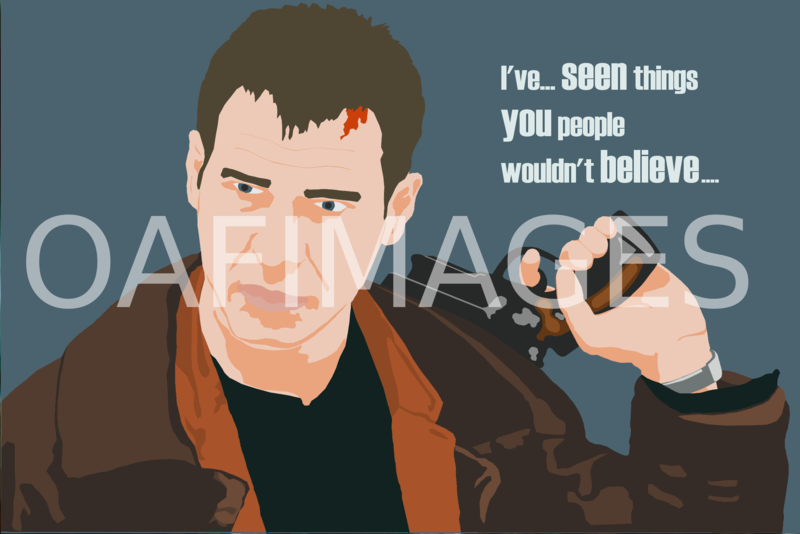 This image is then overlaid onto a coloured background, and I have then included a short quote from the film also. The font used for the quote is stylistically similar to the film but are not "copies" of anything from a movie poster or logo etc. 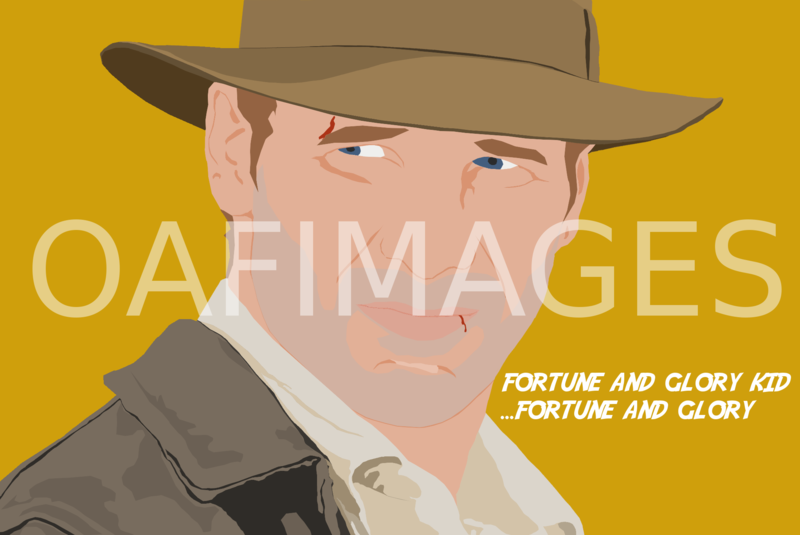 Below is a link to the first two images I am proposing to sell (watermarked), inspired by the films Indiana Jones & Blade Runner. a) Is there any issue with my work (I can include original screen grab for ref if this is useful)? b) Would I be able to include the actors character name within the artwork? c) Would I be able to include the film title within the artwork? d) Would I be able to include the actors real name within the artwork? a) If I were to do a simple artwork, using a short but direct quotation from a film against a coloured background - are there any considerations or checks I would need to perform? b) As above but using a short but direct quotation from a real person (say... JFK) are there any considerations or checks I would need to perform? c) As above but using a short but direct quotation from a book are there any considerations or checks I would need to perform? d) As above but using a short but direct quotation from a song lyric are there any considerations or checks I would need to perform? 3) Finally, with the best will in the world there is always the risk that one may create / sell something which might generate a copyright issue etc despite me doing everything possible to avoid this. In such situations - what is normal practice / process? Would I receive a cease and desist notification etc, or would I require legal advice? I realise the final question is quite broad and vague. Contextually, this is going to me listing maybe a dozen designs on Etsy, and I will consider it a great success if I were to sell 10 of each design a year, but I have to think seriously about the potential implications of taking my hobby into the public domain. If I end up with a legal case on my hands which costs me thousands, it will of course not have been worthwhile at all and I may rethink my approach. Thanks so much for any advice or assistance you might be able to offer, its greatly appreciated. Quite a lot to get through here so apologies if I am somewhat brief in my response. a. In general this approach looks fine and shouldn't lead to problems. Just make sure that when you base your image on an actual screen grab, you end up with none of the original image in yours. b. Yes, you can include character names, firstly because they are not in themselves subject to copyright, and in any case, using such small snippets would not amount to taking a substantial part of the original. c. This could be tricky if the film title has been registered as a trade mark as many are these days. Use the IPO trade mark database to check, and if you find the title has been registered, it would be best to avoid using it. d. Using the actors real names might increase the chance that either the actor or the film company might claim that this was passing off. See here for more details about this. a. b. c. & d. All these types of quotation are OK so long as you cite the source and don't quote too much. Given that the former might possibly affect the aesthetic of your poster, you may do the citing in a very small font in the margin of the poster. See section 30(1ZA) of the Copyright Designs and Patents Act 1988. It's hard to generalise. Some companies will issue a cease and desist letter and leave it at that if you comply, while others may seek to make an example of you and so could be looking for damages. Some studios in particular have a reputation for litigation which they would justify by saying that they are only protecting their intellectual property. You may well find that even where you have done everything legally (as discussed above) you could still receive threats of litigation and if this happens you may need to get legal advice, but hopefully that is a fairly remote possibility. 1) You mention citing work, id be quite happy to add that to the artwork to be extra cautious. Although ive checked your link and also google, im unable to find examplea of how this might be done? Would this citation just be something lile the filme title and year? And to this end, would I need to avoid trademarked film names here in any citation should it be misinterpreted? 2) On the subject of trademarkng. I happened to check the link provided (thanks) but also for some of the quoted text I have used. I notice someone has trademarked the term "fortune and glory" - does this pose me any issues with using the text "fortune and glory kid, fortune and glory" from the film? Assuming that the identity of the artist/graphic designer is not shown on the original film poster, you just need the cite the title of the film. Where a quote from the film is included, the author is likely to be the scriptwriter(s), but given that in most cases there could be quite a few writers, I think it is impractical to try and cite them all. And citating the film title would not infringe any trade mark based on the title since this use would be descriptive and for the purpose of clarification. b. The same mark is used in connection with goods or services which are in a non-registered class, in such a manner that the public is likely to be confused as to the origin of the goods or services which are in contention. This can only occur if the registered mark has an established reputation. So in the case of the mark "Fortune and Glory" this is registered in Class 25 for clothing, footwear and headgear, so your use of the words on film posters would fall within option b. A quick Google search using the terms 'Fortune and Glory +clothing' reveals a number of uses of the phrase on tee shirts, but as slogans rather than as branding per se. In most cases the shirts also reference the Indiana Jones movies (eg here). On that basis I can't see anyone being confused between your posters and tee shirts, given that the common link would be the Indian Jones film, not the shirt. Quoting from the film is entirely permissible and so there should be no copyright or trade mark issues in that specific case, although clearly there may be a more general risk of making a film poster based on a feature film poster, as I outlined in my earlier reply.